Time for a new figure review. Well, ok it’s apparently a Nendoroid. 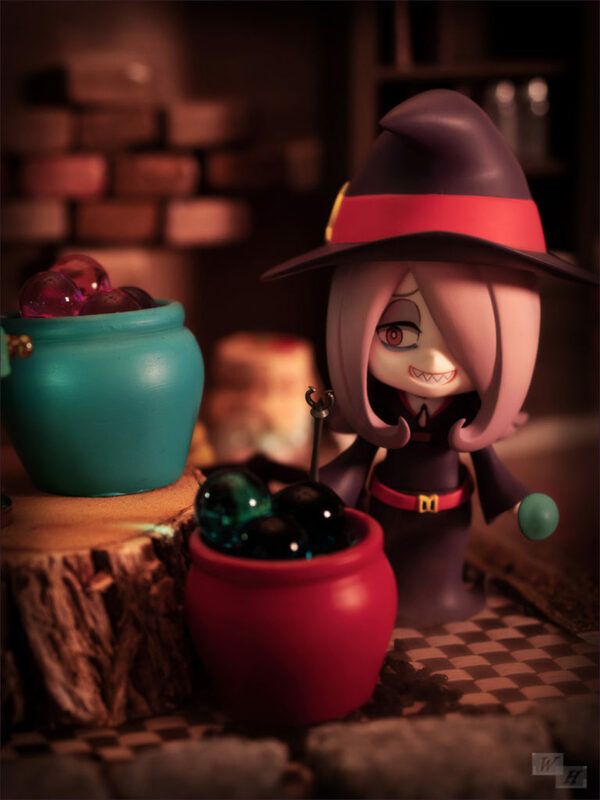 It’s Sucy Manbavaran from Little Witch Academia. You all know that I rarely buy Nendoroids or even try to review them. Sometimes I’m nevertheless convinced to order myself one of those deformed cuties. Currently I own Akihime Sumomo, Saber #121,Yoko Littner #053, Nao #073, Takamachi Nanoha #263, Minami Kotori #548, Sucy and last but not least Cu-Poche – Amami Haruka. 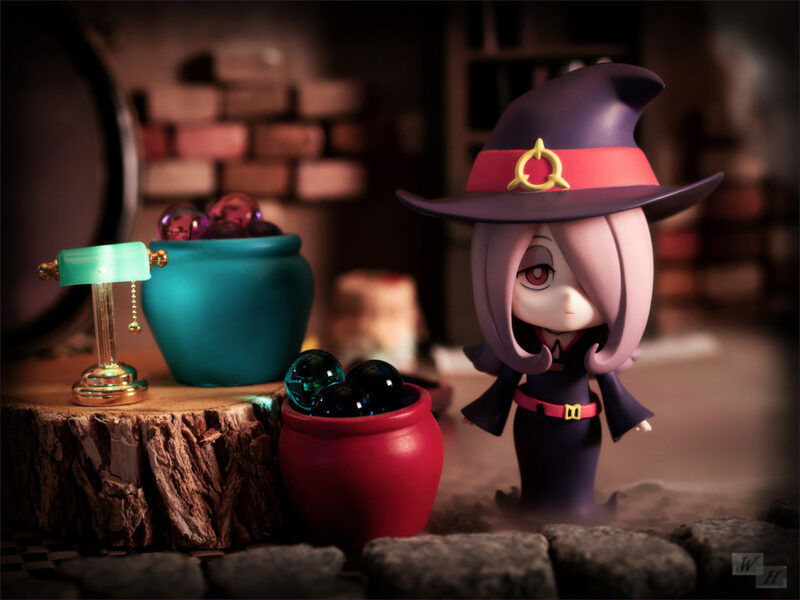 Sucy Manbavaran is one of the three main protagonist in Little Witch Academia, which is a quite lovely anime that aired in 2017, it has a really nice and cozy atmosphere. Furthermore it’s hilarious with brilliant comedy comments and crazy stunts. Little Witch Academia also reminded me of high school life, there are the typical character archetypes, the prodigy, the bullies and the “freaks”. Within the setting of a witch academy this set of characters turns into something very entertaining, not to forget the enchanting OST. The story begins when main heroine Akko enrolls in Luna Nova Magical Academy, she has the will to become a witch, but no noticeable talent at it and not the skill to ride a broom. Without being mean it’s quite amusing how much she fails and how Akko ends up in awkward situations because of her lively personality. 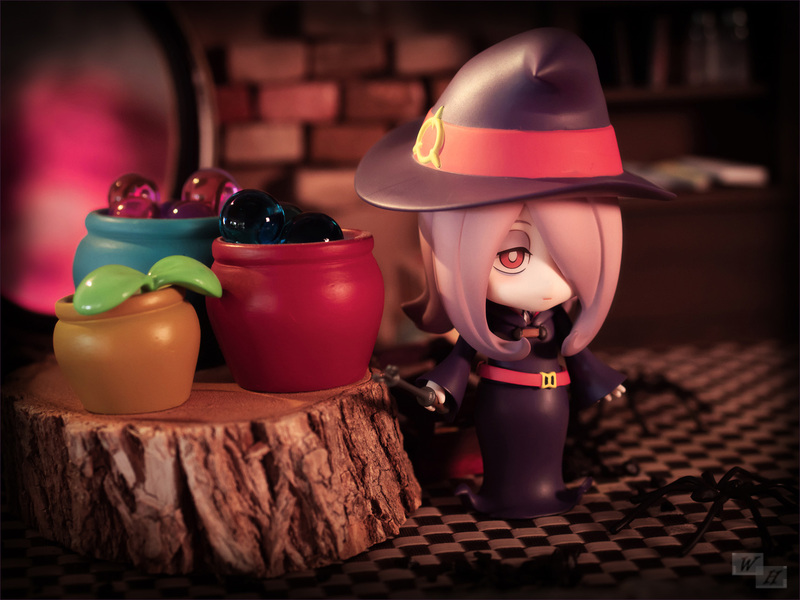 Akko starts to explore the academy and her own magic ability together with her loyal roommates and friends Lotte and Sucy. The episode based adventures are of these three are really enchanting and funny as hell. 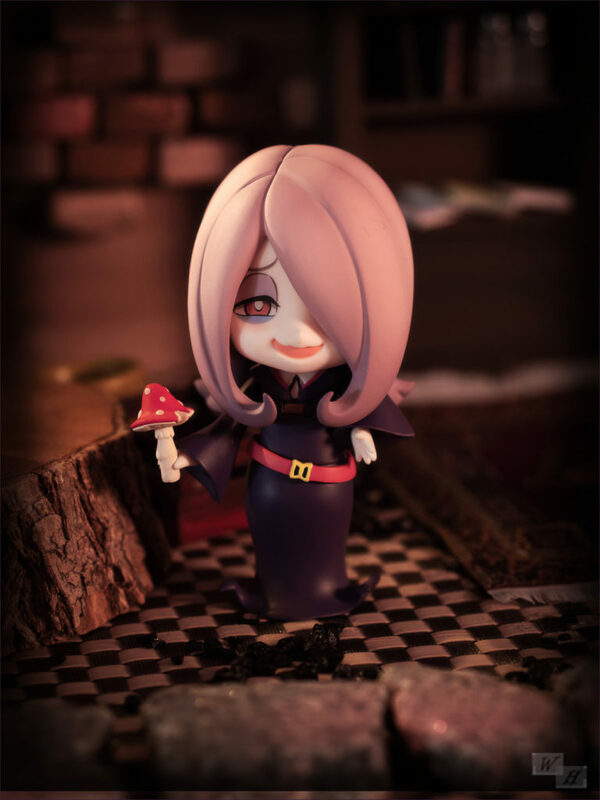 Sucy is such a fun character, she often seems to be apathetic, but is full of sarcasm and sometimes also a little bit evil. 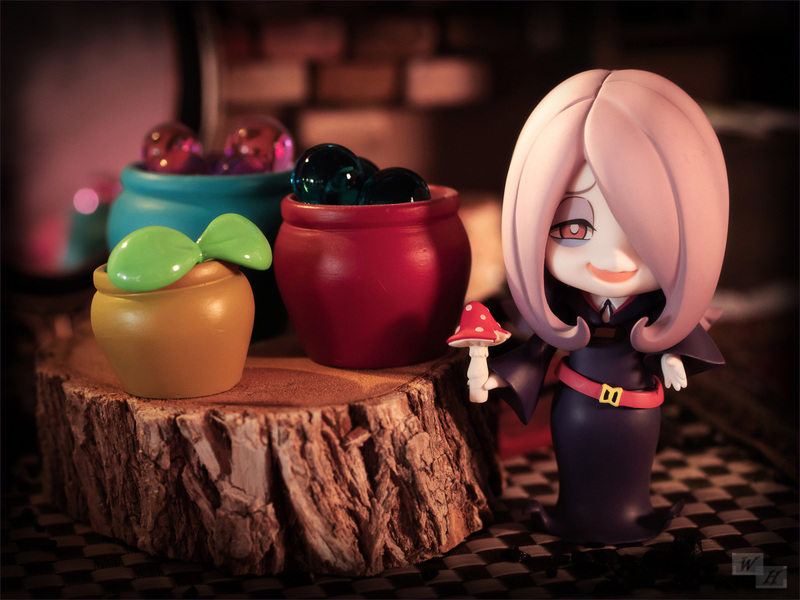 When it comes to magic potions or mushrooms Sucy’s real passion awakens. Her magic ability is rather high, but it’s mainly used for pranks on others. She enjoys to make potions and to collect rare ingredients for them. Sucy likes Akko, because she makes her daily life interesting, with her impulsive ideas and lack of talent. She often calls her stupid, but she actually likes her a lot. She appears not very compassionately, but when Sucy is together with her friends she is happy and will sometimes even show a smile. The subtle smile is not included on this Nendoroid. Her faceplates have very funny expressions, my favorite is her evil and sadistic smile. She also has an apathetic face and another one where she seems to be under the influence of “drugs”, it’s hilarious to have such an unique faceplate. 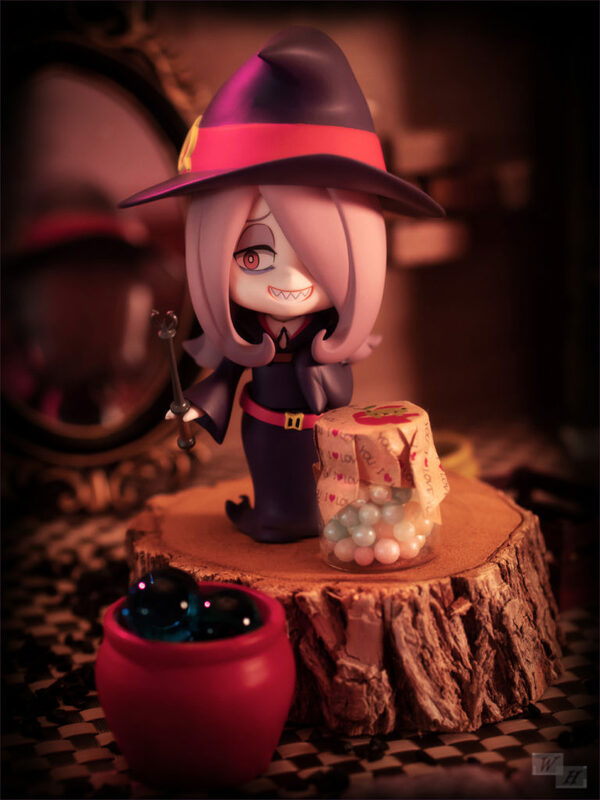 This time I’ve put a lot of effort in the setting, to create a convincing witch den, fortunately I already had all the equipment from previous years photo sessions at hand and could go all out for the cute Sucy Manbavaran. 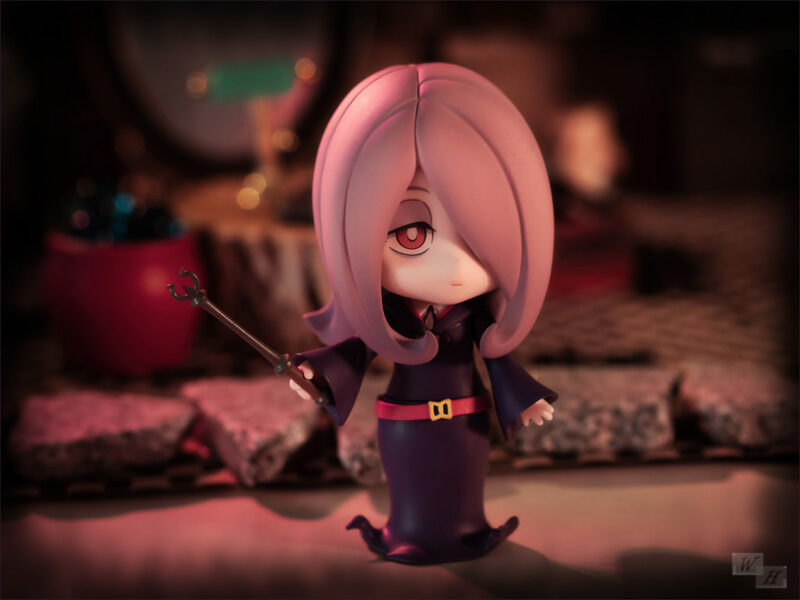 Nendoroid Sucy is great with two of her tiny hands she can hold things, the magic stick, mushrooms or the potion which is also included. 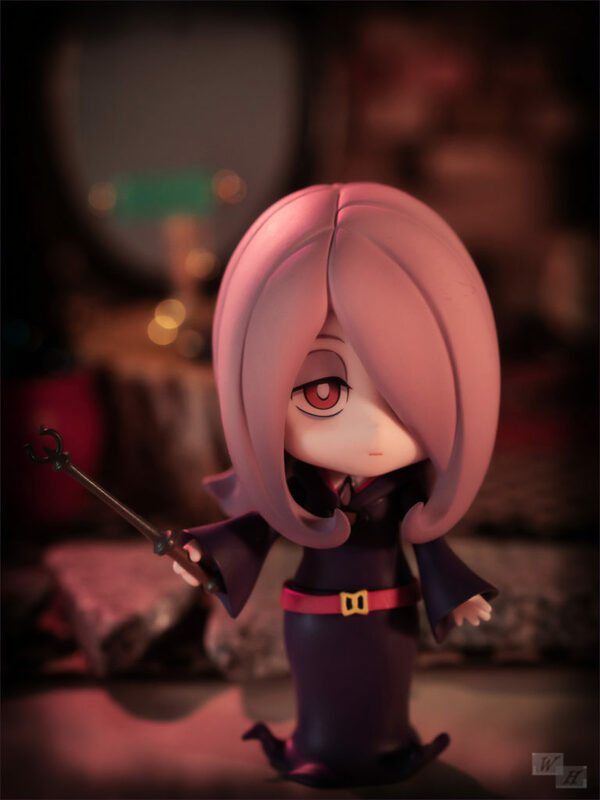 What I also really like about this Sucy is that she is able to stand own her own without support because of her floor long dress. Nevertheless with her hat she will be top heavy. 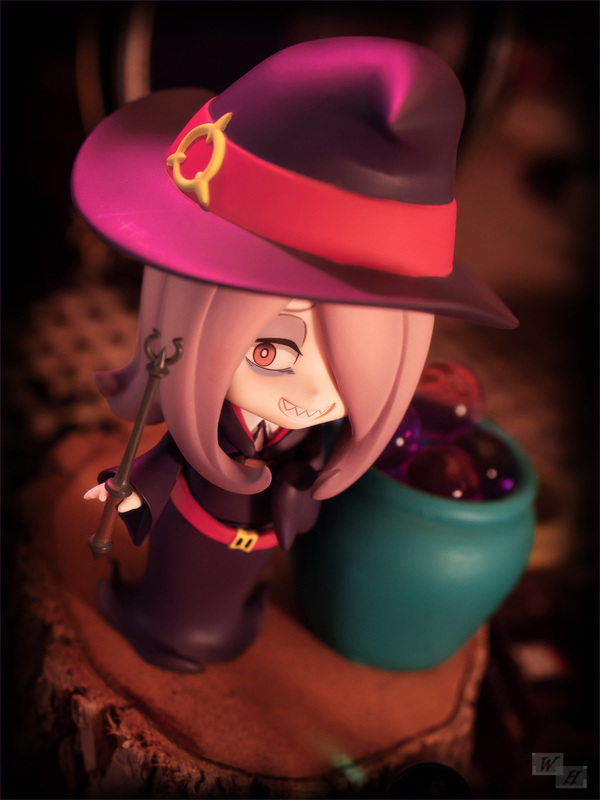 The last Nendoroid I’ve bought was Minami Kotori, when I took a look in the box of Sucy, I was quite surprised about the number of parts for her, aside from the usual Nendoroid parts like 3 faceplates and a stand there were quite a number of arms, cute hands and witch like parts to play with. This Nendoroid is really meant for playing around. 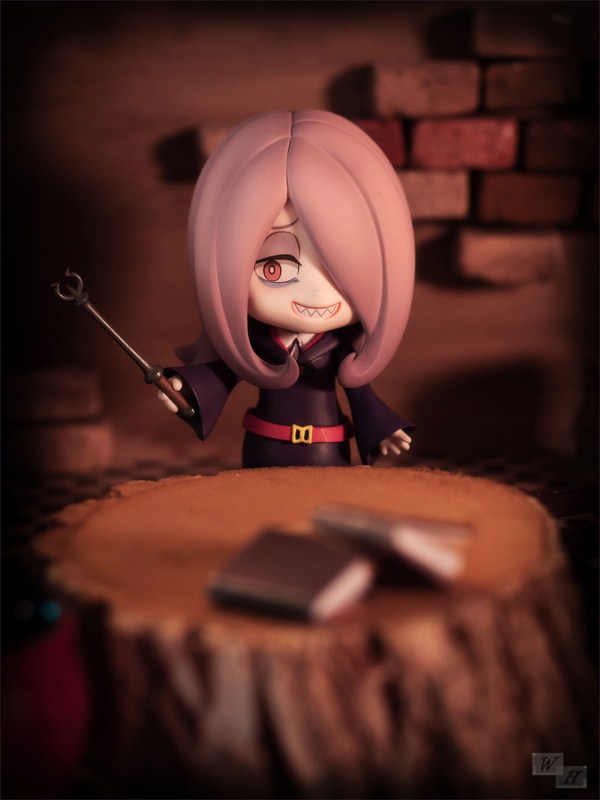 Sucy Manbavaran as Nendoroid is a nice adaption from the anime, that I liked so much. 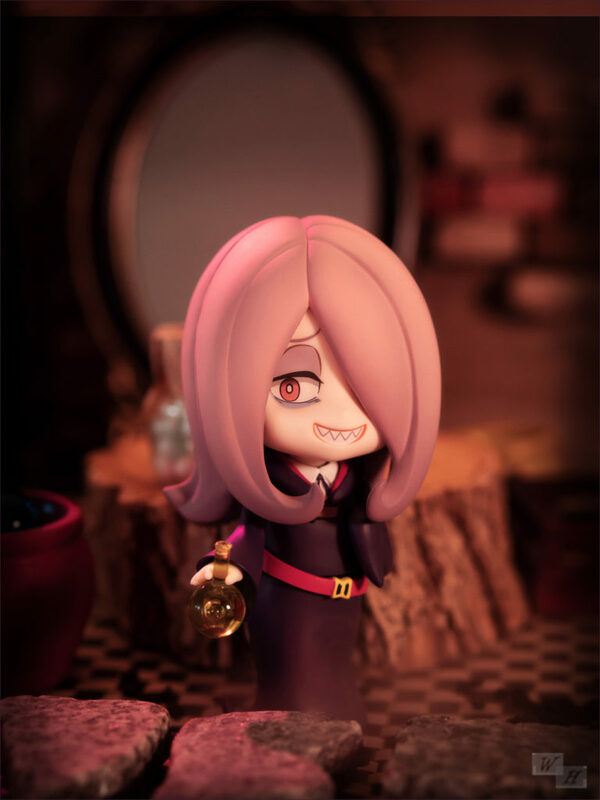 I like Sucy’s unique and strangely adorable look, her uniform is pretty and the hairstyle that hides one of her eyes is quite attractive. Also the dark eyelid makes the faceplates interesting and expressive. This Nendoroid came with so many parts, I’m not even sure if I used all of them. I won’t lie, it was much work with changing all the different parts back and forth during the photoshooting, but it was unproblematic. 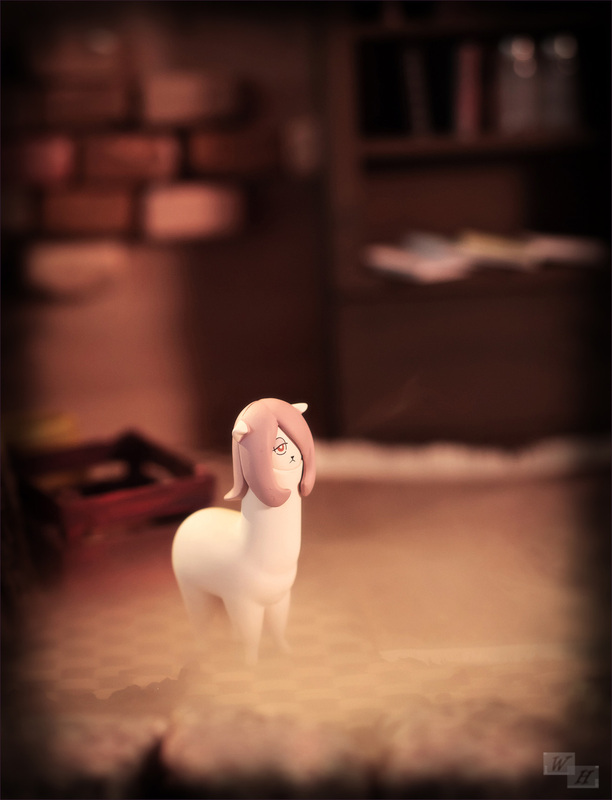 I enjoyed to play around with Sucy in this funny, spooky setup. Wha…?! So many Nendoroids! What is this betrayal! 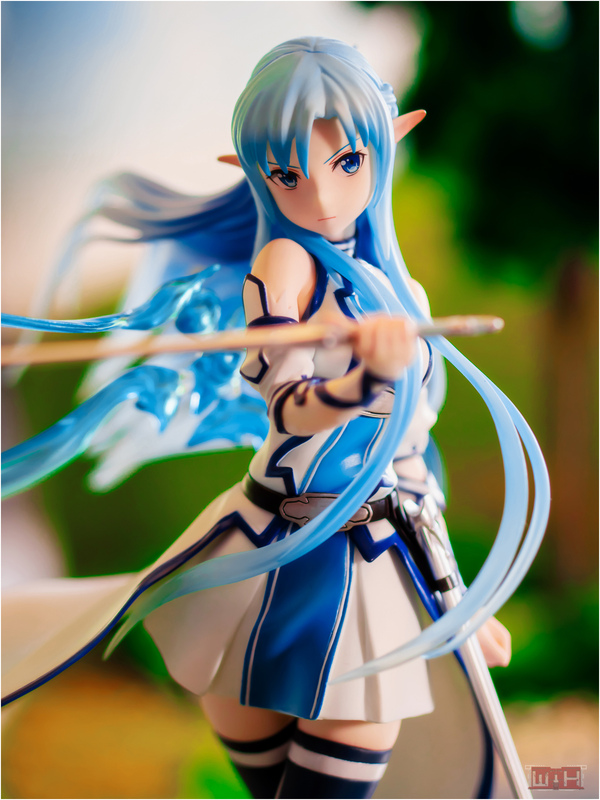 My two biggest complaints with Nendos is that they all feel too much the same or it is characters that I don’t feel fit that aesthetic. 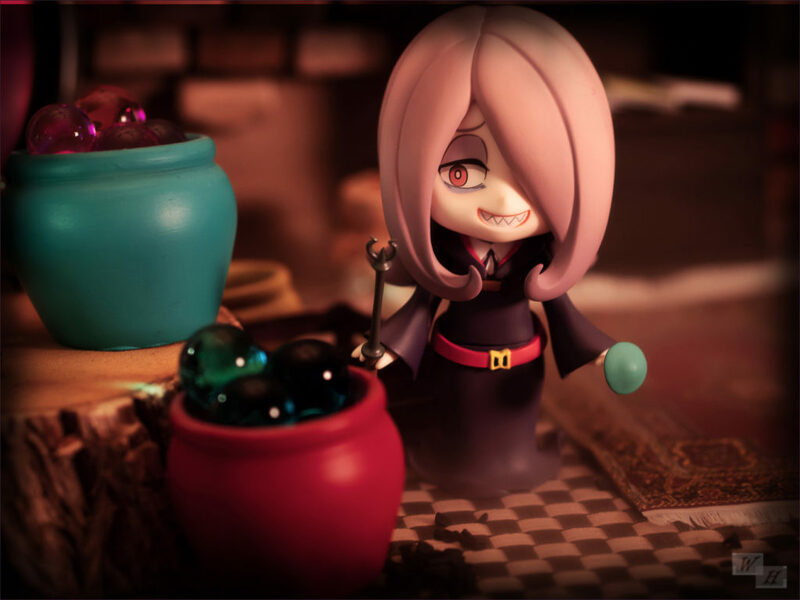 Sucy is one of those few times were I feel that is not the case on either front at all. The high strung shenanigans Akko and company get involved with tend to lend themselves greatly to a stylized portrayal. 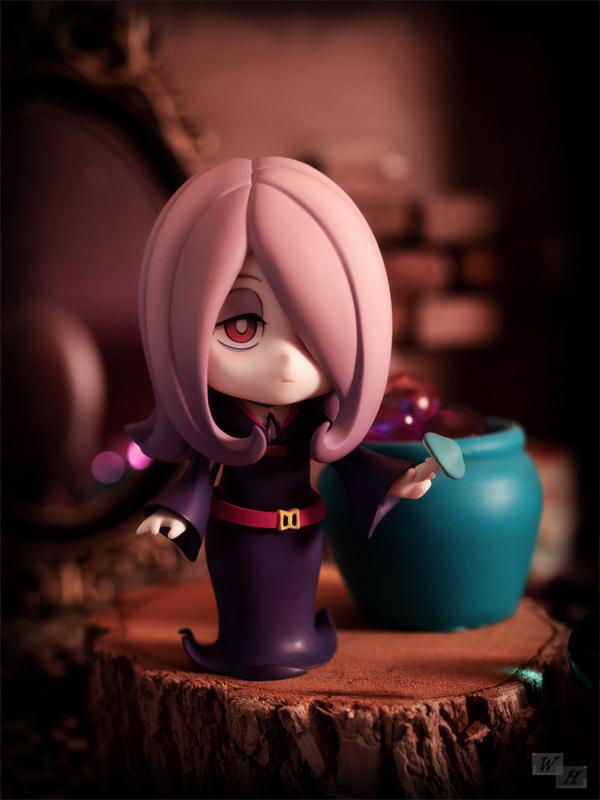 It also seems Sucy has quite a bit of things to play with, something that I find increasingly lacking in poseable figure releases as of late. My favorite is probably her 1 million dollar smile! The set looks quite nice, although it is definitely a dungeon I feel I shouldn’t step in at all! Ahaha … well suddenly they were there, I don’t dislike them. Some Nendoroids are not as interesting as others and are probably not always made with top motivation. 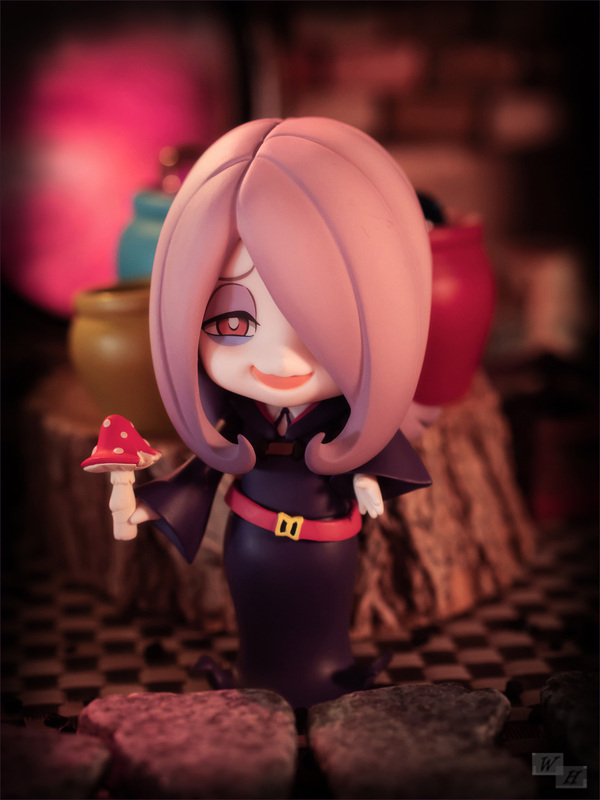 I liked Sucy anyway and her stylish design convinced me to order that crazy Nendo. I was quite surprised about the number of parts, it’s good to have them. Ahahaha I went all out, although I had no non spooky stuff that would fit the witch theme.